On July 5th 2018, 46 highly-respected scientists, science policy experts, naturalists and community representatives have joined forces to support a formal complaint to the Science Museum Group, calling on it to end its partnerships with oil giants BP, Shell and Statoil/Equinor. The complaint sets out detailed evidence that the museum breached its Ethics Policy and is undermining its relationships with important stakeholders. The full text of that 40-page formal complaint document here. 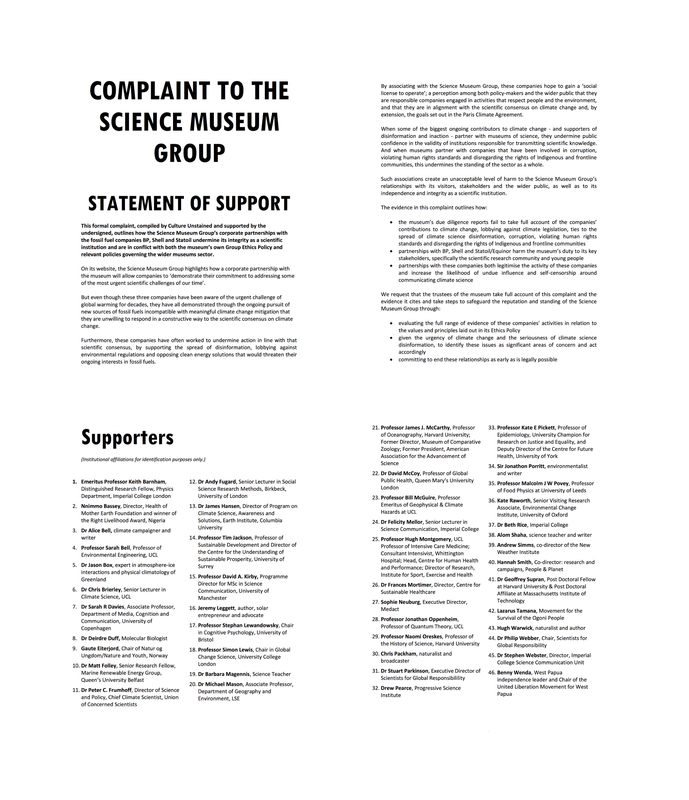 The background to the complaint, researched and compiled by Culture Unstained, sets out detailed evidence of how the museum breached its Ethics Policy and is undermining its relationships with important stakeholders, especially scientists and young people. You can read the full complaint by clicking here. You can read our launch blog here and a Guardian article, ‘Science Museum under pressure to shun big oil sponsorship’ here. You can view the SMG’s current Ethics Policy here. You can see the museum’s current sustainability policy, as posted on its website, here. The museum knew about the companies’ track records of corruption, pollution and links to climate science denial – but did not judge them to be in conflict with its responsibilities as a trusted science institution. No due diligence reports appear to have been created before 2016, despite relationships with Shell and BP going back decades. The report on Shell appears to have only been rapidly created – or immediately updated – the day after our FOI request was submitted. You can view the reports by clicking on the links below. Culture Unstained has also been researching the benefits that these companies get from a sponsorship deal with the Science Museum Group. We have obtained copies – with significant redactions – of several of its contracts with its oil sponsors.